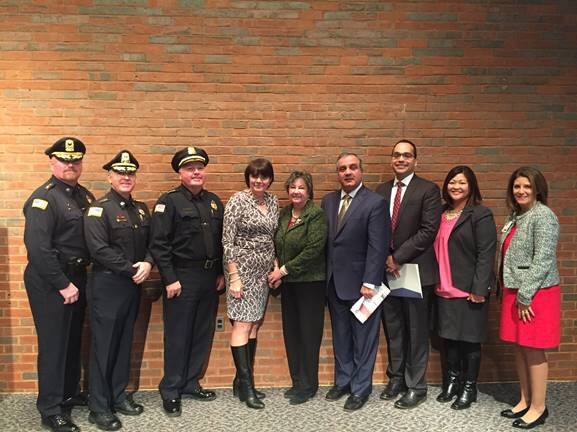 Left to Right: Tewksbury Police Chief Timothy Sheehan; Chelmsford Police Chief James Spinney; Lowell Police Superintendent William Taylor; Middlesex District Attorney Marian Ryan; Lowell City Councilor Rita Mercier; John Chemlay, Co-Owner and President, Trinity Ambulance; Alexander Usher, Director, Pharmacy and Retail Operations, Walgreens; Darci Halmen, RPh., Pharmacy Supervisor, CVS Health; Michelle Davis, Vice President of External Affairs for Lowell General Hospital and Board Chairman of the Greater Lowell Health Alliance. LOWELL – Middlesex District Attorney Marian Ryan, CVS Health, Walgreens, Trinity Ambulance and Lowell General Hospital today joined police chiefs from Chelmsford, Lowell and Tewksbury to announce a new public-private partnership to encourage the safe and secure disposal of medications in an effort to deter prescription misuse and reduce the current rate of fatal overdoses in the Greater Lowell area. This initiative also includes the announcement of a new service being offered by police departments to make individualized house visits to residents who cannot easily leave their homes or do not have ready access to prescription medication disposal sites. Starting this month, partner agencies will begin distributing an informational palm card to inform the public about how to safely dispose of unused, unwanted or expired prescription medications of any kind. These cards will be distributed across all 12 CVS and Walgreens pharmacies in Lowell, Tewksbury and Chelmsford to customers who obtain a prescription narcotic. In addition, the cards will be distributed by Lowell General Hospital through their patient education and community outreach programs and by Trinity Ambulance through mailed billings to patients for medical services rendered. “Walgreens is committed to being part of a comprehensive solution to combat the opioid epidemic. Our 13 safe medication disposal kiosks throughout the state make it easy for individuals to dispose of unwanted medications at no cost,” added Alexander Usher, Director, Pharmacy and Retail Operations, Walgreens. “Trinity is proud to partner with these Healthcare and Public Safety agencies in order to stem the rising tide of opiate abuse. We will share resources and time on prevention, education and outreach to accomplish this goal,” added John Chemaly Co-Owner and President, Trinity Ambulance. The informational card will also provide information to the residents of Chelmsford, Lowell and Tewksbury about the new pick up service for drug disposal available through their local police department. This service will assist the elderly and disabled as well as other residents who may be experiencing a personal hardship. “Prescription medication disposal boxes are really a best practice in trying to respond to this opioid epidemic that is decimating our area. We are proud to stand with our partners and optimistic that this new multi-disciplined initiative will raise awareness and ultimately save lives,” said Tewksbury Police Chief Timothy Sheehan. Research suggests that approximately 70% of misused prescription medications are obtained from someone else’s medicine cabinet, rather than purchased on the street. Unused and unwanted medication that is not properly disposed of can have dangerous effects on families and communities and can result in thefts for the purpose of substance misuse. It also prevents medications from entering streams and rivers, which can occur when medication is improperly poured down a drain or flushed down a toilet. Residents are reminded that drug collection boxes donated by the Middlesex District Attorney’s Office, using drug forfeiture revenue, are located in most police departments across Middlesex County including in the communities of Chelmsford, Lowell and Tewksbury. Residents are able to dispose of approved items in these boxes 24 hours a day, 7 days a week with no questions asked. Customers can also drop medication off at any time at the 24 hour Walgreens store located at 54 Plain Street in Lowell. Through the CVS Pharmacy Safer Communities program, the company has donated more than 600 medication disposal units to police departments across Massachusetts and throughout the country. These units have collected more than 47 metric tons – or 100,000 pounds – of unwanted medication since 2014. The company also encourages youth drug abuse prevention through its Pharmacists Teach program, which has connected CVS Pharmacists with local schools to discuss the dangers of prescription drug abuse in classrooms. More than 150,000 students have already participated in the program. This far reaching, comprehensive approach ensures that residents are receiving critical safety information about prescription medication disposal at multiple heath care contacts: emergency response, hospital-based care, and pharmaceutical treatment. In total the initiative announced today will reach thousands of residents in Greater Lowell.